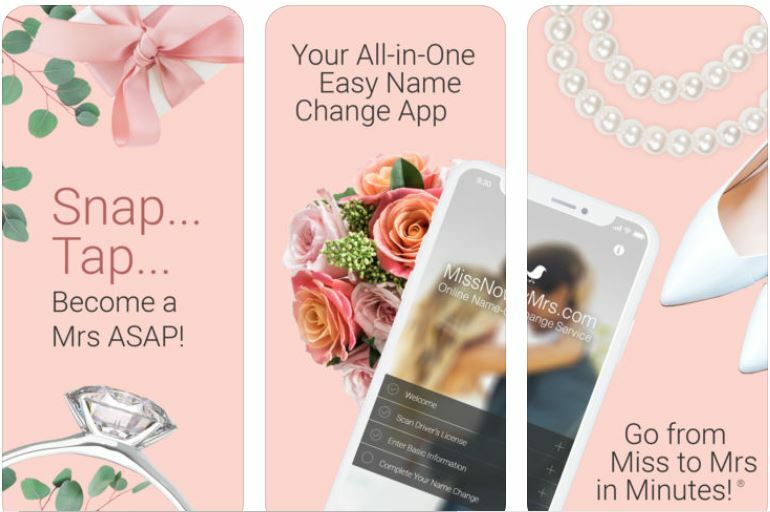 We recently launched the MissNowMrs Name Change App with the goal of saving newlyweds a staggering 13.7 million hours this Spring. How can we do that? By allowing newlyweds to Snap… Tap… and become a Mrs. ASAP on their phones! Step 3: Tap to select your married name choice, address, and the answers to 15 questions. Step 4: Pay $69.95 to have all of your completed forms, pre-addressed, and posted envelopes mailed to you ASAP! 42% of wedding planning is done via smart phone/tablet, so it made total sense to provide newlyweds with a convenient way to change their names on their phones! We started MissNowMrs back in 2007 to make the 13 hour name change process easier. Our online service streamlined name change into a 30 minute experience, and now our app condenses into 3-4 minutes! We love being name change pioneers. So, if you’re a busy newlywed who wants to change from your maiden name to your married name we’ve got the solution for you! Head over to the app store and check out the MissNowMrs Name Change App. We can’t wait to help you transition from Miss to Mrs.!